We’ll cover a wide range of disciplines from Concept, Design, Characters and Environment creations sharing our workflow and methodology with you. First, let’s talk a little bit about our world design and concept workflow. 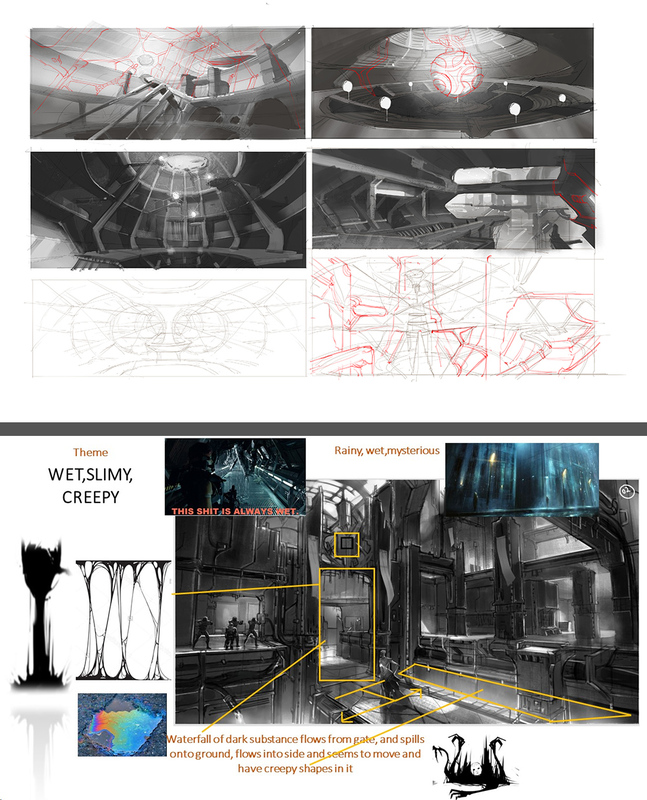 We’ll start from basic sketches, followed by some mood board feedback, thumbnail greyscale images and then how we ultimately end up with our colored roughs. Going in we have a rough idea of what we’re looking for when making these images; It must depict some new location with iconic architecture. It should invoke a certain emotion and color palette while belonging to a specific faction. At the same time, it has to expand the universe we’re designing. This is easier said than done when you’ve already made 50 other locations prior to this one! The initial sketches should be cheap and quick to produce. We keep this very loose (as in pencil scribbles on a napkin or drawings on a whiteboard). Keep the level of detail low, since you don’t want to spend too much time on a single image. You’re looking for volume, impressions, and compositions to help develop interesting ideas. Instructions tend to be as basic as “large open space with a mysterious object in the middle of the scene” or keywords like “Tall narrow chamber. Sadness. Shadows with eyes. Floors covered in spirals” and so on. Mood boards help a lot with the initial brainstorming process and augment the rather basic instructions when looking for new ideas. Again, the use of keywords and some choice images go a long way in sparking the imagination in these early exploration phases. This first image has some basic chambers, and already we’ve had a round of feedback marking specific things we like or feel is missing from the scene. 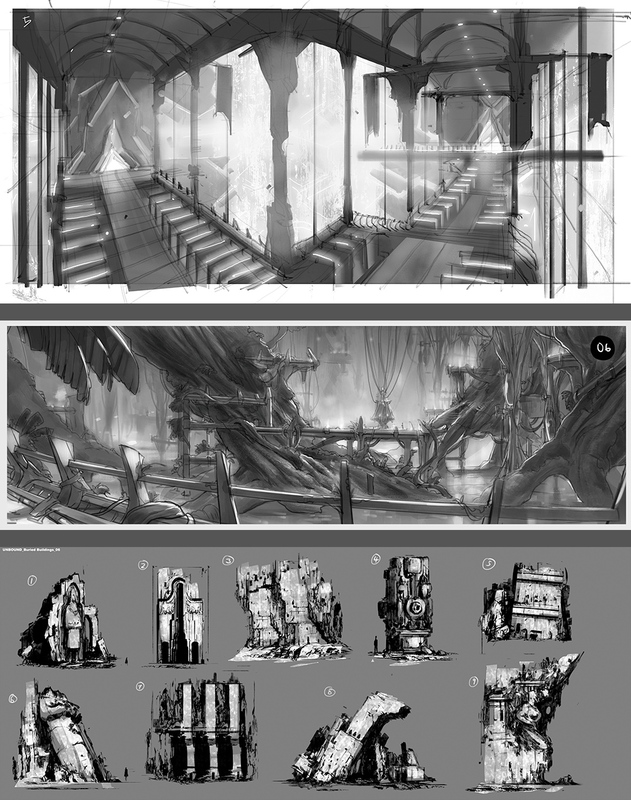 In the second image, you see a small sample mood board that spawned from the initial sketches. Adding imagery to the keywords. Slimy like what exactly? Dark oil, drool, or viscous webbing? Are all the surfaces covered? Does the dampness appear in specific locations? What type of emotion should this place convey when you find yourself there? With the initial exploration out of the way, we can start to focus on developing images that lay down more values and atmospherics in the scene. Ideas can be fleshed out quickly, and various viewpoints can be used to show off the scene. For this series of images, a widescreen format was one of the criteria to give a nice vista. Another approach or supporting set of images can be more isolated objects and or structures. Whichever gives you the most information to work with. The key is speed and readability. We don’t want to spend too much time yet on any particular image. The first image gives us a high overview covering many potential architectural pieces. At this point, you can play with scale very easily by simply dropping in a human figure of different sizes giving a very different feel to the scale of the location. The second image has a similar approach though much closer to the ground. There is a great sense of depth and parallax making the viewer curious to look up or wondering what is that device off in the distance? Now comes the phase where we add another layer of information. We’ve locked down our perspective and scene composition, but till now all our work has been done in greyscale. So the next step requires us to establish a color palette when making these images. We have a few things to consider based on the keywords from our initial thumbnails and mood boards; What emotion are we trying to invoke? Which faction does this location belong to? Do we have a set of rules for said faction, or is it a completely new are? I If so we must make sure it does not clash or overlap with anything else we’ve designed. In these two examples, we ditched the linework completely. A bigger focus on color and value separation without relying on linework is required at this stage. A limited palette is used in the first image while the second one gets a little more adventurous. In either situation, we start to play more with material behavior a bit as well, even though it's not the main focus. Color can have a big impact on how you perceive the scene. Is it warm and safe? Cold and late in an unfamiliar land? These are questions that need to be in the back of your mind when developing images at this stage. And that’s all for now. You have successfully completed your first exploration into our workflow for Unbound Oceans. Stay tuned for more cool stuff and insights. Cheers!